Thomas Michael Williamson was born on 1 October 1855 to William and Anna Maria (nee Annesley) Williamson. He was educated at Lyndhurst College in Glebe, and left at 16 to serve as an articled clerk in the law firm of his father’s brother John, Williamson and Williamson. The law firm was located in Sydney’s CBD. In 1873 on October 8, Thomas Williamson married Annie McNamara, and the couple had seven children. In 1886 they purchased as a summer house Truganini Cottage, located in South Street Rydalmere. Now used as commercial office space, visitors can see TM Williamson’s initials carved in the decorative timber entranceway to the former ballroom. The Williamsons were a prominent Redfern family, and Thomas Michael Williamson was the third generation to serve on Redfern Council. His grandfather Michael Williamson was an alderman from 1859 to 1861, serving as mayor from 1860 to 1861. His father William was an alderman from 1861 – 1881, and mayor in 1866, 1874 and 1875. In 1921 TM Williamson died of asphyxiation and heart failure brought on by cyanide poisoning. In 1891 Williamson published a law text, Small Debts Recovery Acts and Other Statutes, Together with Supreme Court Decisions Affecting Petty Sessions Courts. Ironically, in 1894 he was disbarred for misconduct after his conviction for embezzlement of £776 from a client, and did not practice again until 1896. Shortly after this scandal, the Williamson family moved to Western Australia, where Williamson was listed as ‘TM Williamson, Financial and General Agent’. In 1921 Thomas Williamson was summoned to appear before a Royal Commission established by the West Australian government, to investigate the methods used by financial agents when buying war gratuity bonds from returned soldiers. Despite the Royal Commission finding that Williamson had no case to answer, he committed suicide by ingesting cyanide on December 16. Williamson was known for his energy and organisational skills, and his extensive legal experience with a number of other municipalities was regarded as invaluable for his work with Redfern Council. Thomas Williamson was active in his local Catholic church, serving for more than three years as President of the Mount Carmel Conference of the charitable organisation of St Vincent de Paul, and resigning only when he moved from Redfern to Rydalmere in 1886. During this period, he was responsible for having the reserve adjoining church property granted as a park, and also donated more than £100 to decorate the church interior. As the Independent Member for Redfern, TM Williamson was elected a Member of the Legislative Assembly from 1885 to 1887, taking a strong stand on a number of issues relating to ‘the interests of the working man’. These included increasing wages, opposing a rise in income tax, and fighting for the eight hour working day. Despite his successes as an MLA, Williamson resigned after only two years, citing pressures of business. Board’s Settlement Bill Committee no. 24 24-29 March 1886 – 9 April 1886. 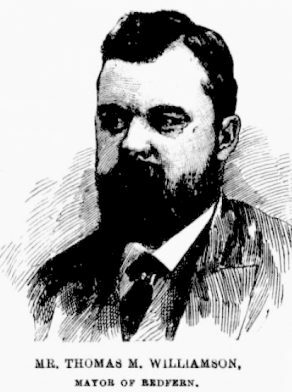 TM Williamson served on Redfern Council as an alderman from 1882 to 1887. In 1888, he was elected unanimously as Redfern mayor. He was known for advocating that local councils apply for substantial loans from the colonial government to carry out public works, and in 1888 arranged for Redfern Council to borrow £50 000 from a London bank in order to complete extensive municipal sewerage works. Whilst serving as mayor, TM Williamson formed the Redfern Literary and Debating Society, which aimed to provide local community members with lectures, essays, debates and readings for their ‘mental and moral improvement’. He was president of the Society, was involved in local rowing groups and was president of several local football and cricket clubs. Williamson also served on the Electric Lighting Committee. (Redfern was one of the earliest municipalities in the colony to build an electric powerhouse to provide electricity to its residents). –Redfern Minute Books 30 Aug 1878 – 24 Aug 1883; 24 Aug 1883 – 10 Jun 1886; 10 Jun 1886 – 14 Mar 1889. Small Debts Recovery Acts and Other Statutes, Together with Supreme Court Decisions Affecting Petty Sessions Courts, 2nd, edn, Sydney, Maxwell 1891.